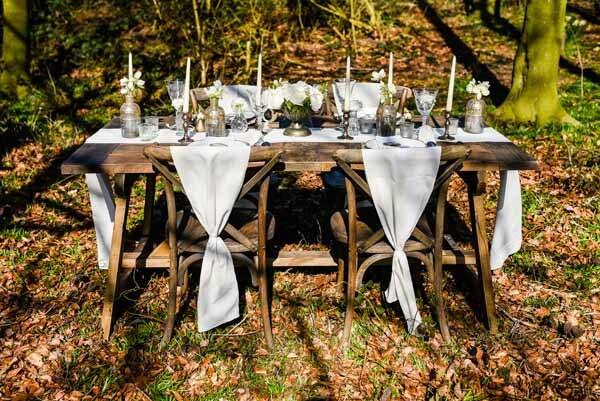 Set the scene with our natural cotton table runner. 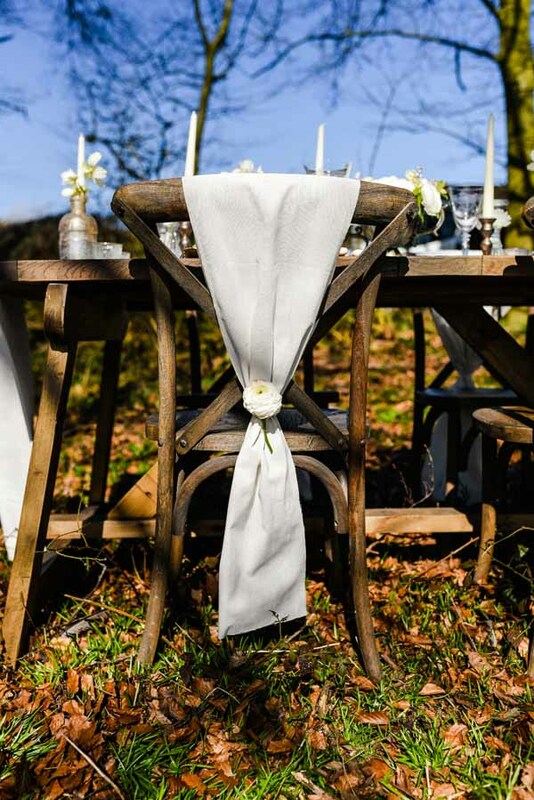 This will look ultra-elegant along a wooden trestle table, but you can also use it as an alternative cover for your wedding chairs. Simply tie the runner at the middle with a piece of ribbon and add a pretty bloom for a floral touch. 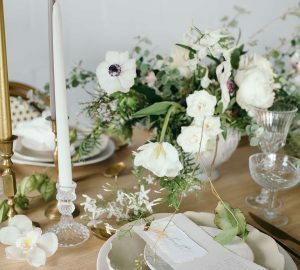 White flowers and foliage will fit in perfectly with a neutral wedding colour scheme. 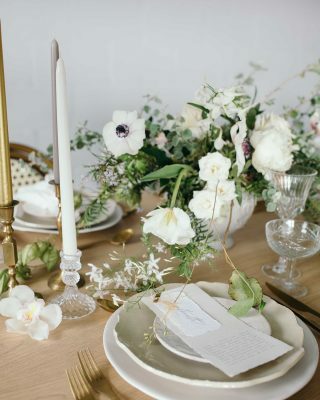 Tie your theme in with your wedding place settings by using neutral napkins and luxe gold cutlery and plates. 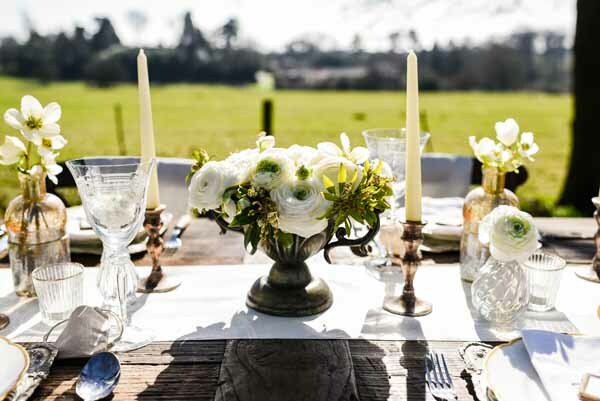 Our antique gold trays offer the perfect base for your place settings, but they also look lovely displaying cocktails, wedding favours or candles. 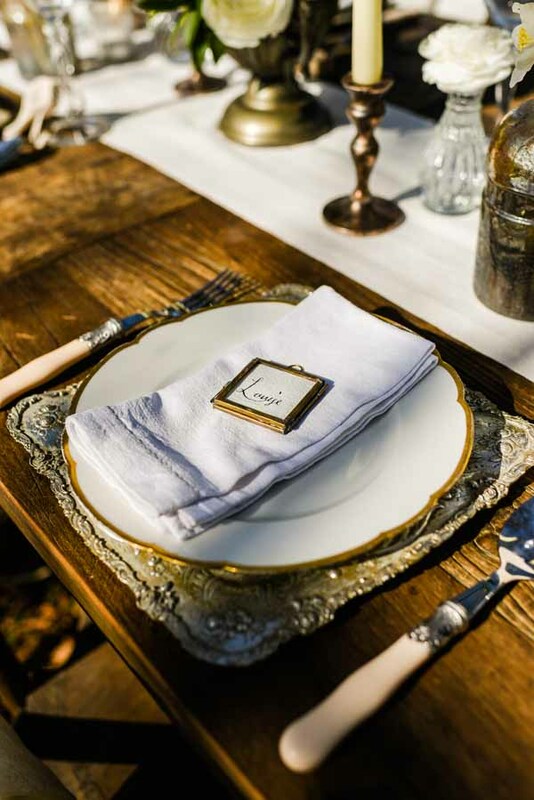 Add a finishing touch to your wedding place settings with our tiny brass photo frame. 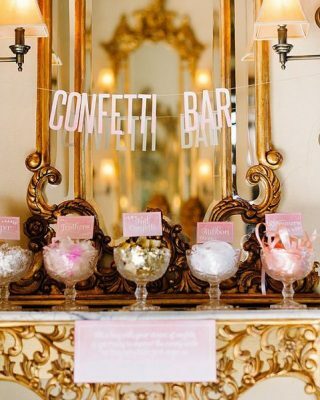 You can handwrite the name of each guest and place it in the frame, or you could use a photograph of each guest! They’re the perfect way to show your guests to their seats in style. 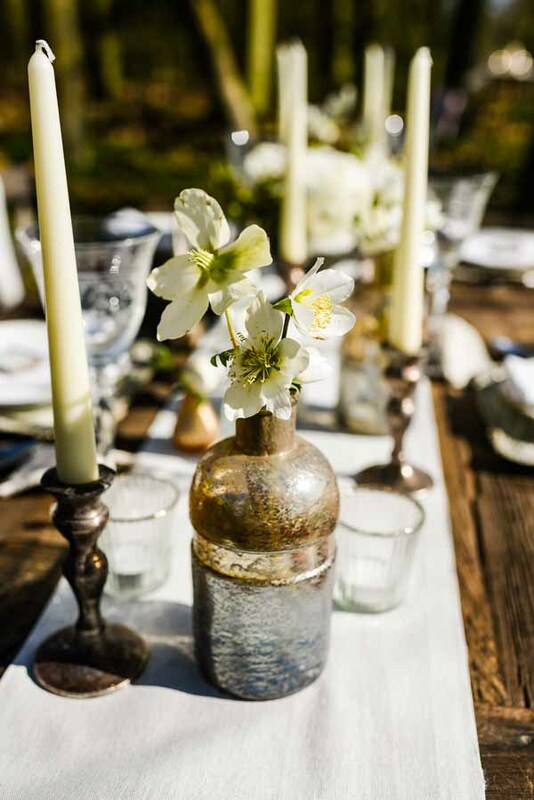 When it comes to wedding table centrepieces, we love the thought of lining the table runner with a variety of our chunky bronze bottle vases full of pretty posies. Team with some metallic candle sticks for a warm and romantic glow. For a wedding table centrepiece with the ‘WOW’ factor, look no further than our gun metal grey urn. This looks stunning brimming with wild foliage, greenery and elegant white flowers. 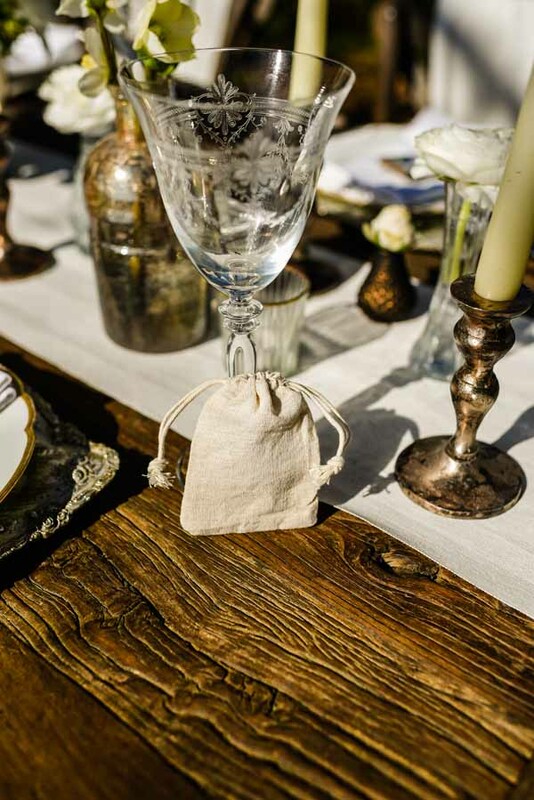 Offer your guests wedding favours in our natural linen bags, they’ll fit in beautifully with the neutral colour scheme. 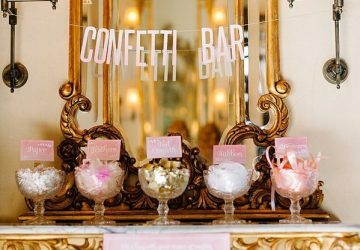 Take a look at our fabulous ideas for wedding favours here! 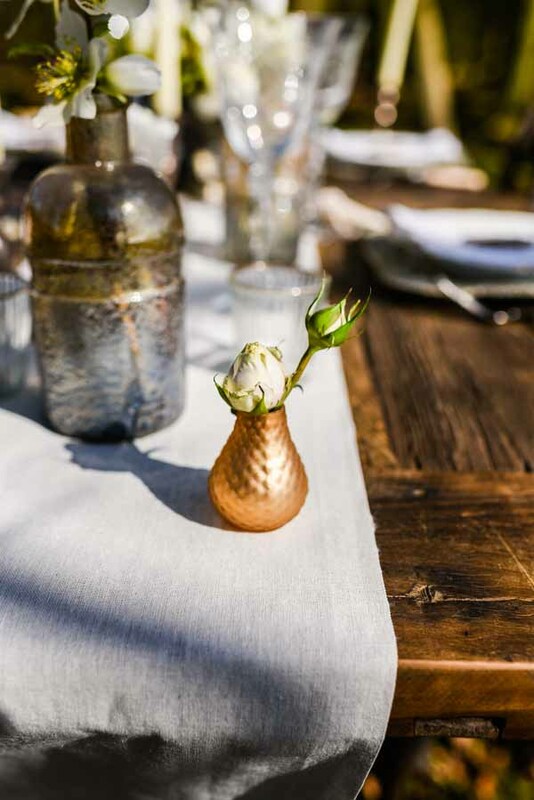 Give your wedding tables a dash of glamour with our gold bud vases. A single flower will look so pretty in them, and they can also be used along window sills, fire places or even your card and gift table. 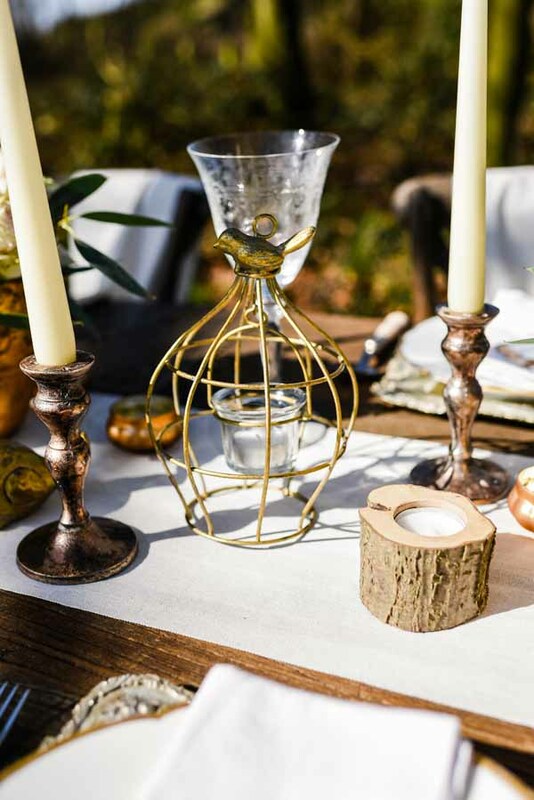 If you want to add a rustic vibe to your table decor, our tree branch tea light holders are a must-have addition to your special day. 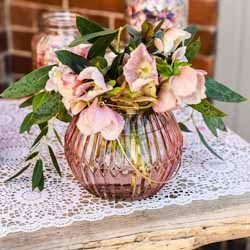 They look lovely dotted around your table or your wedding tables and venue, and will help to create a welcoming glow in the evening. 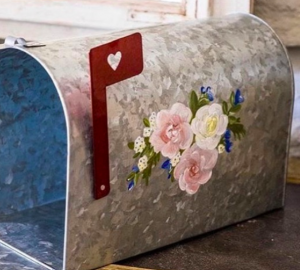 They look wonderful used alone, but they also work well with metallic details and decorations. Our gold birdcages make gorgeous hanging decorations for your wedding venue, but they also make divine table centrepieces! 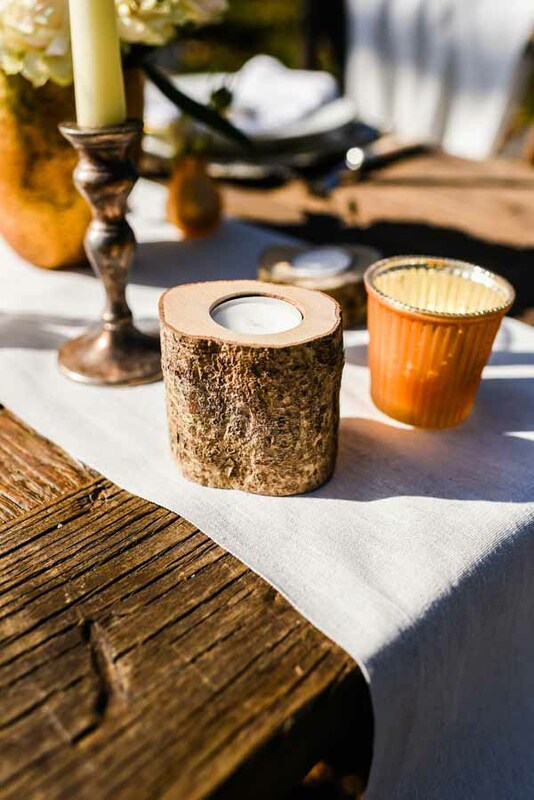 Simply add a small tea-light and place along your table runner. You can use it alone, or surround it with other candle sticks and golden decorations. The choice is yours! 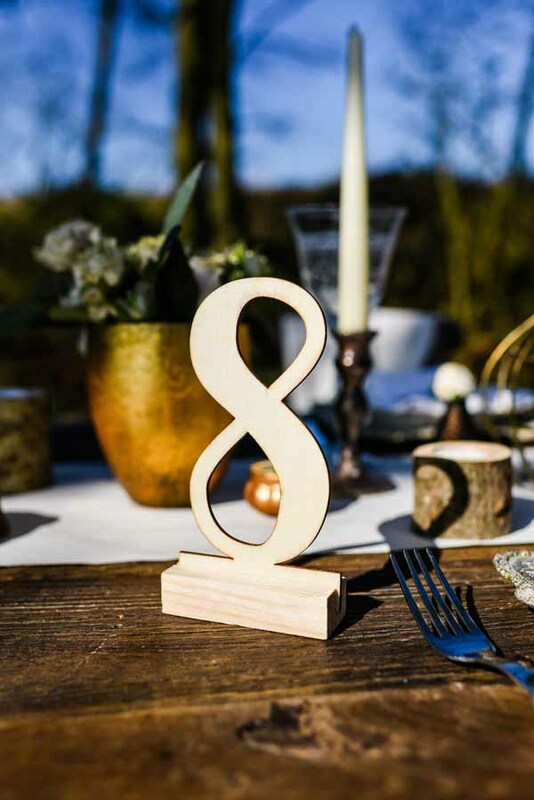 Our simple wooden table numbers are the perfect choice for a neutral colour scheme. 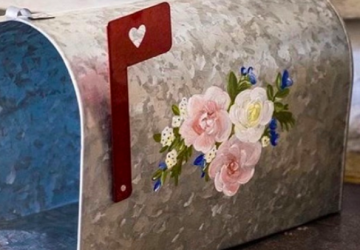 The calligraphy style is modern and elegant, while the natural colour is made for a rustic celebration. 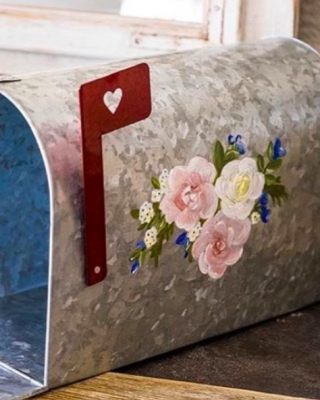 You can also spray-paint them to suit your colour scheme, and they look very chic in silver or gold. 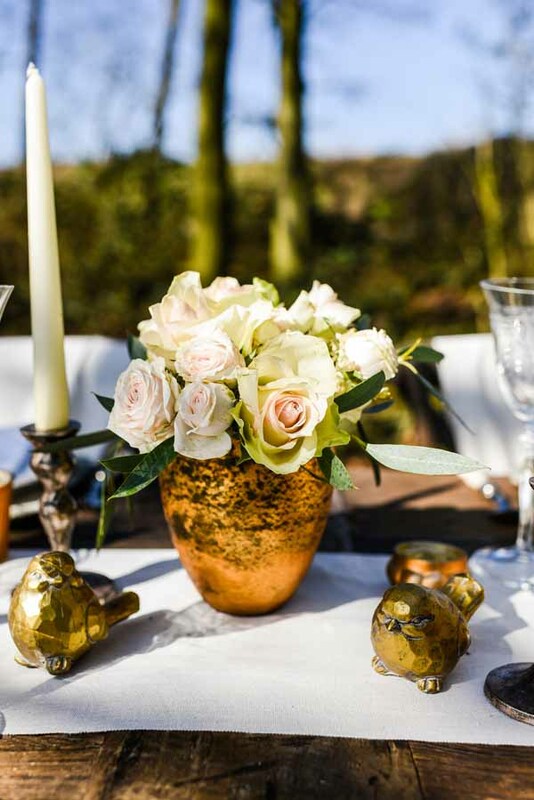 Make a statement with your table centrepiece by using our luxe gold vase. Pair with beautiful blooms for a country garden feel, or use by the entrance of your wedding venue as glowing lanterns. 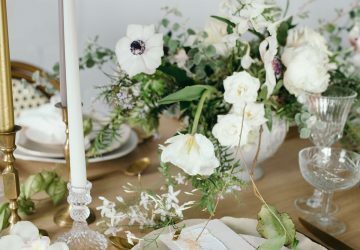 A neutral colour scheme with a hint of gold is a beautiful choice for any wedding, and there are lots of gorgeous ways to style it. 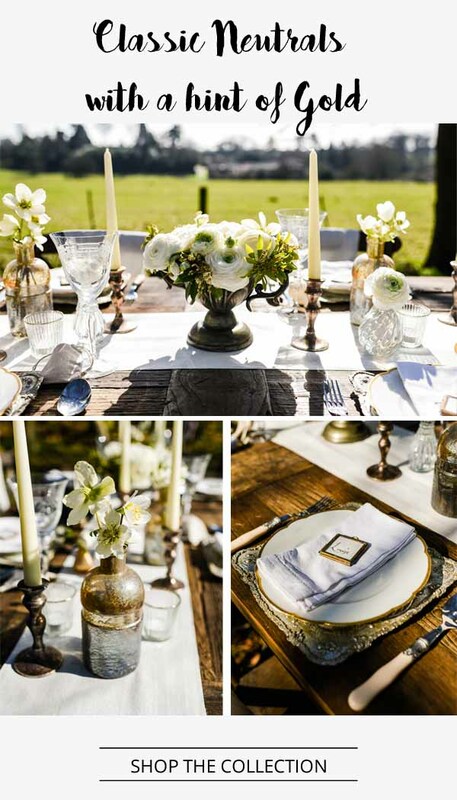 Do you love the idea of a neutral colour scheme with hints of gold? Then shop this look here!